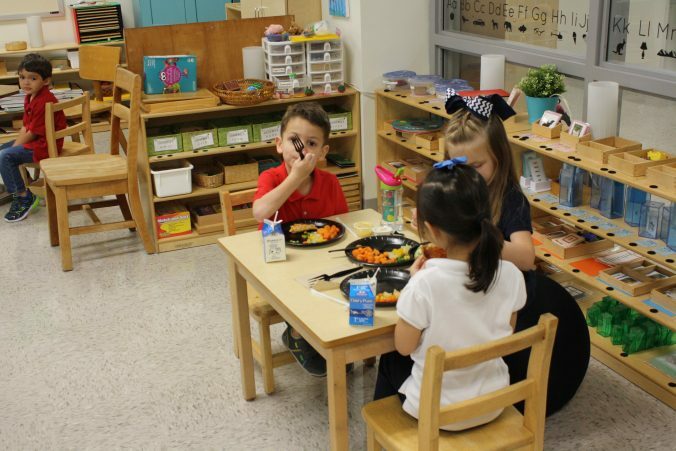 Garden Oaks Principal Lindsey Pollock worked with Nutrition Services to bring the concept to her school. She said there was some initial skepticism about the program from teachers, but as the program nears its first anniversary, everyone has fully embraced it. “If I tried to go back to the way we were doing things before, I’d have a riot on my hands,” Pollock said, laughing. Nutrition Services Area Manager Kory Keimig said there are many benefits to family-style lunch, from eating lunch at noon rather than 10 a.m. to taking less time to walk to the cafeteria. He said it also helps the students with social skills. “It’s extremely beneficial to the students participating, as it helps to encourage their social skills and empowers them to make their own choices,” Keimig said. Kuhnen said the program helps her students learn the “grace and courtesy” lessons of the Montessori curriculum. Bringing the family style lunch concept to fruition took work. Nutrition Services developed overall training geared towards teachers and training about safely transporting the food carts. Additionally, anyone serving food also had to complete Civil Rights and food handler trainings to satisfy the City of Houston Health Department requirements. The department’s efforts paid off, as it hopes to expand the program next year. Pollock said family-style meals is something she’s wanted to try for a while and would love to see the program expand to include the entire Garden Oaks campus.